Here is detailed review of Sana Hadanomy Skin care product review! This products was kindly sent by ArtieStyle.com as a review purpose and they also sponsored the giveaway item as well! Thank you ArtieStyle! ArtieStyle are base in USA, offers wide range of asian beauty products as well as Japanese Snacks! Also offers worldwide shipping with low flat rate shipping, FREE shipping on orders over $50 within USA! ArtieStyle have offered special Discount code for my readers! What it says about Hadanomy in their website at Sana? MICROCOLLAGEN*1 combined 1,000mg , luxuriously! We have succeeded in making a heavy composition of cosmetic-grade micro-collagen*1 that has begun being used in food products and whose beauty effects have attracted attention. Collagen with small molecular masses is ingested by the skin quickly and delivers much moisture. Composed of many beautiful skin-inducing elements, from sodium hyaluronic acid (*2), which is known for being highly moisture-rich, to acerola extract (*2) and honey (*2). The natural aromas also give off a gentle fragrance. Hadanomy collagen is free of artificial colors and mineral oils and has completed non-comedogenic testing (*3) and patch testing (*4). *3 This product does not necessarily prevent all users from getting pimples. *4 Patch testing is a testing method where cosmetic products are applied to the skin. Sana Hadanomy Collagen Mist is a gel-type mist, contains collagen that has been specially processed to make it sink deeply into skin in an easier way, enhancing skin elasticity and moisture level. The skin is left supple. 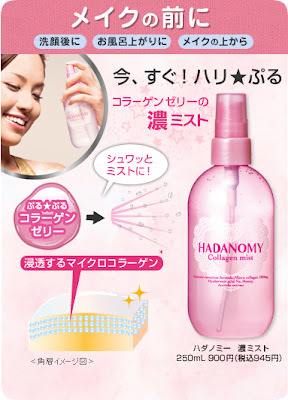 Sana Hadanomy Collagen Mist delivers a light floral scent. This Hadanomy Collagen Mist provides moisture with the combination of Micro Collagen 10000mg In addition, it contains Hyaluronic Acid Na, Honey and Acerola extract. The ingredients absorb into the skin instantly to make your skin soft and supple. Sana Hadanomy Collagen Lotion is color free, mineral oil free and non greasy. It contains natural aroma scent. The rich ingredients can penetrate into each layer of th skin immediately to create a super moisture, soft and supple, and with good elastic skin. 1. Dry your face after washing your face with cleanser. 2. Spray the mist to your face. 3. Gently hand press it, so it can be absorbed thoroughly and speedily. I really like that it goes on light texture almost like water down gel and not sticky, all of the Hadanomy collagen product have the same scent like floral but fruity reminds me of lycee a bit which I enjoy! It does moisturize pretty well for being a light mist type, the bottle size are a good portion and it havent made me breakout, I like to apply this as a toner after I wash my face~ but the down fall of this spray type are that it doesnt spray evenly,, it sprays in a ring and it totally misses the middle part, I donno if its just mine does that but its really annoying that it doesnt apply evenly. This Hadanomy Collagen Lotion provides moisture with the combination of Micro Collagen 10000mg and Hyaluronic Acid Na, Honey, and Acerola extract. 2. Use a clean, fresh cotton ball or pad, and apply toner to it. Sana Hadanomy Collagen Cream is a rich cream that contains 1000mg Micro Collagen!!! This Hadanomy Collagen Cream provides moisture with the combination of Micro Collagen 10000mg and Hyaluronic Acid Na, and other moisturizing ingredients. These rich ingredients can penetrate into each layer of the skin immediately to create a super moisture, soft, supple, and with good elastic skin with an ease. 1. Scoop a small amount of gel on your middle, ring and pinky fingers. Use small amounts of cream at a time reapplying as needed. 2. Press the fingers of both hands onto the center of the forehead and work the cream slowly outward. Pat gently around the eye using the ring finger. 3. Work the gel in evenly around the jaw line, chin, mouth and cheeks using small firm circular movements in counter-clockwise motions. Do not pull the skin! 4. Starting from the collarbone and moving up to the chin, massage the cream over the throat using upward strokes. I usually dont use moisturizer cause I tend to breakout with most heavy cream moisturizer, I stick with serums or non oil moisturizer to avoid breakouts so I wasnt too sure if my skin would like this cream, texture of this cream its thick but feels like gel and goes on light and not heavy oily feeling leaving the skin supple feeling, the scent isnt as strong as the lotion but still have the same floral lycee scent, so I used it for 2 week straight at first I really liked it because it didnt seem to break me out, my skin felt hydrated in the morning but after a while I noticed a small bumps on my face like a whiteheads on my cheek and side of my nose so I stopped using this cream but still maintained using the other Hadanomy products and my skin calmed down so I think this cream with its oil was not a good match for my sensitive/oily skin but if you have dry skin type I think this will be good as a lotion. 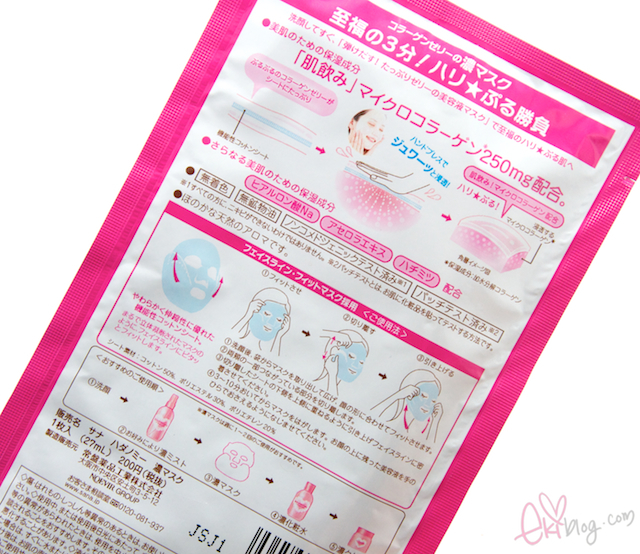 Sana Hadanomy Collagen Mask contains 250mg Micro Collagen in every mask!!! 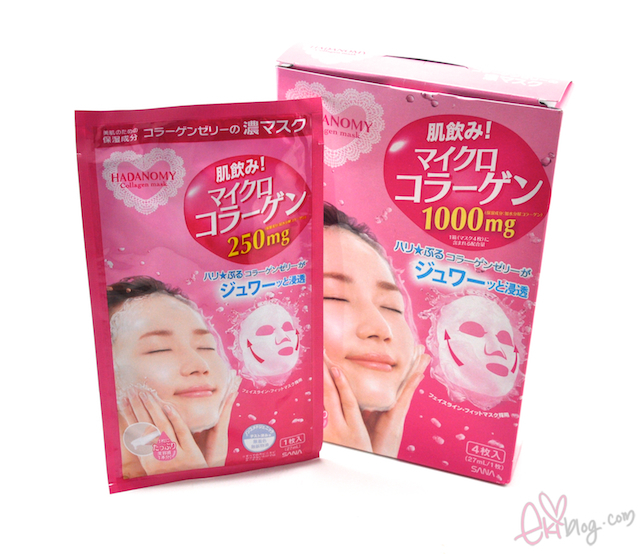 This Hadanomy Collagen Mask provides moisture with the combination of Micro Collagen 250mg and Hyaluronic Acid Na, and other moisturizing ingredients. These rich ingredients are formed in Jelly form and it can penetrate into each layer of the skin immediately to create a super moisture, soft, supple, and with good elastic skin with an ease. 1. 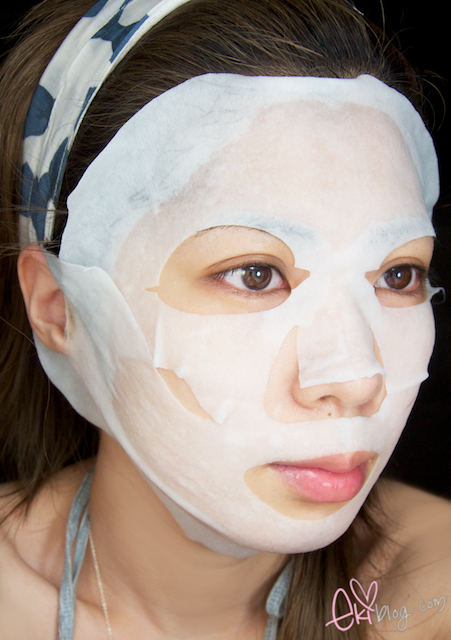 After cleansing and toning your face, pull tabs to open the mask sheet. 2. Unfold the mask and place the sheet gently so that it covers your entire face. 3. Leave on for 3~10 minutes or so, and then remove. Press the remaining fluid into skin with your hands. *For best result, use 2~3 times per week. ok so the paper was thick/sturdy and good material, it came with lots of liquid, was not sticky so I like that, in the description it say to pat your face over the mask to activate the collagen jelly in between the sheet so I was patting my face while wearing this mask which felt good made it felt more hydrating when you pat lol the shape of the mask are so stupid and ugly it misses a big gap around the nose area but after applying this mask for about 15 min my face felt super hydrated, smooth and supple! The next day my skin was glowing :D so Minus the stupid mask design the actual serum on this mask are really good! Thanks for the in depth review and discount code. The packaging on this series is super cute. The mask design is really silly lol. Going to try this out after hadalabo. Sad, I live in Australia but thanks for the review anyways Eki! I read another review on it not too long ago, and both mentioned the lotion works nicely (with bad packaging). Thank you for the reivew Eki! I love you gave full description on each individual product. Very helpful indeed and thank you so much for being able to do another giveaway for us followers! this products look like so cool ! And they are very pretty ! I always see these products at Mitsuwa and thought the packaging was so cute that I wanted to try it! I think I really want to try the Collagen lotion next time :D Thank you for sharing this with us, Eki! I think I'll pick up the mask soon! 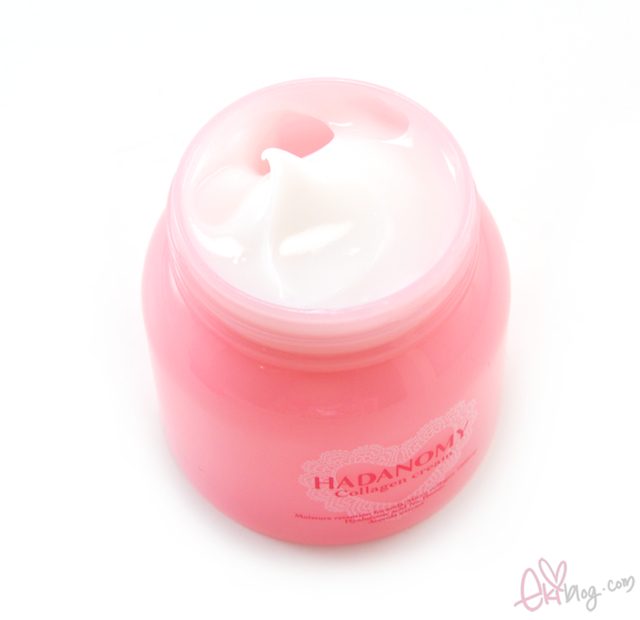 i have used hadanomy moisturizer too and it broke me out after 2 weeks or so using it. i have stopped instantly. you are lucky that you have small bumps as mine was huge breakout! mega acne on my cheek. LOL! now i am going to finish using it very soon. i stopped using it on my face but i use it for my chest and neck cream. hehe! don't wanna waste it. thank you, and great review!! the bottles are just so adorable!! Oh geez, your mask looks really huge for some reason. The "flaps" at the side don't go as far as my ears and the nose area has more coverage. There are also smaller eye and mouth holes on mine... lol, maybe my face is bigger but it can't be THAT big. XD Maybe the shape has improved since then? anyone know of a website I can purchase these products? i am interested in buying and finding them all in one site. you're an expert on this subject. Fine with your permission let me to grab your RSS feed to keep up to date with forthcoming post. Thanks a million and please carry on the gratifying work. rooms "One of the most disturbing practices happening in spas today is leaving clients unattended in treatment rooms,"
sayѕ Kile Law, owneг of Blue Water Spa in Rаleigh, NϹ. together wіth rеlaxing spa treatments togеtheг with bοdy massаge and reflexologу аnd facіаls.